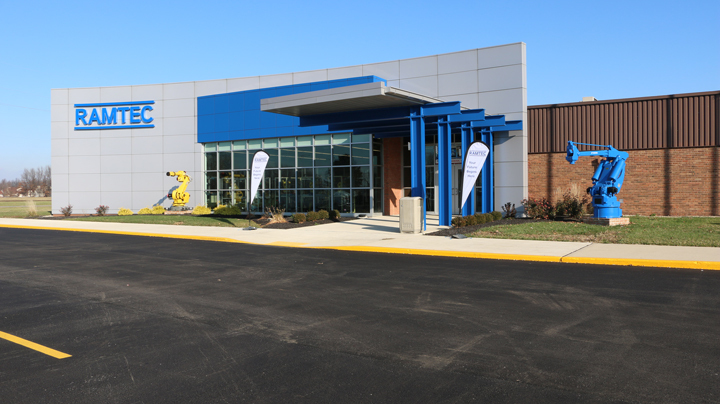 RAMTEC Career center in Ohio is home to the largest, most comprehensive robotics education center in the U.S. In order to increase the number of skilled manufacturing employees to meet future market needs, the school is now training students ranging from middle school to industry professionals with collaborative robots from Universal Robots. RAMTEC (The Robotics and Advanced Manufacturing Technology Education Collaborative) located in the manufacturing hub of Marion, Ohio, receives input from a large group of industry representatives involved in shaping its curriculum. When local companies started installing a new breed of industrial robots called collaborative robots – or simply cobots – RAMTEC took note. In contrast to traditional industrial robots that stay bolted down inside a safety cage, cobots can work outside enclosures, move between tasks, and operate right alongside humans. “We did some research and realized that Universal Robots had one of the best collaborative robots on the market. We always want to stay ahead of where manufacturing is going to ensure that when our students leave this facility, they can use the equipment adapted by industry,” says Ritch Ramey, RAMTEC coordinator overseeing robotics training at the nine Tri-Rivers career centers in Ohio. that RAMTEC is the flagship member of. RAMTEC’s goal is to bridge the looming skills gap estimated at 2 million unfilled manufacturing jobs by 2020. “If we don’t fill that gap, companies are going to move off shore again. In Ohio alone, I think there are 60,000 openings right now that we could help fill by getting high school students and workers retrained, both in the higher-skilled jobs, teaching them to program and operate robots and other machinery while also helping facilitate the entry of more robots taking over repetitive, lower-skilled tasks,” says Ramey. Kierstyn Graber is a student taking some of her high school credited classes at RAMTEC. After having worked with other industrial robots before the introduction of the UR cobots, she was surprised to discover their ease-of-use. “Within two minutes we had a basic program running. With the other robots you have to test it, figure it out, put it all on your computer, run out to the robot and monitor it, and then go back and fix it. With UR robots, you hit play on the touch screen right next to it and all the moves happen immediately,” says the student who also enjoys the “free drive mode” that enables user to simply grab the robot arm and “teach” it the desired task by moving it through waypoints added on the touch screen. A common application for industrial robots now taught at RAMTEC is machine tending with a UR robot picking and placing parts in a 3D printer. The printer also came in handy when Mr. Hammock asked the students to make their own gripper for their new cobot. High school senior, Canyon Gamble, jumped to the task: “We went online, I looked up a schematic of the face plate for the UR3 robot and started building from the ground up, figuring out how to attach it and learning exactly how the I/O’s work on the robot,” says Gamble as he excitedly shows “the claw” as he nicknamed his new end-effector. 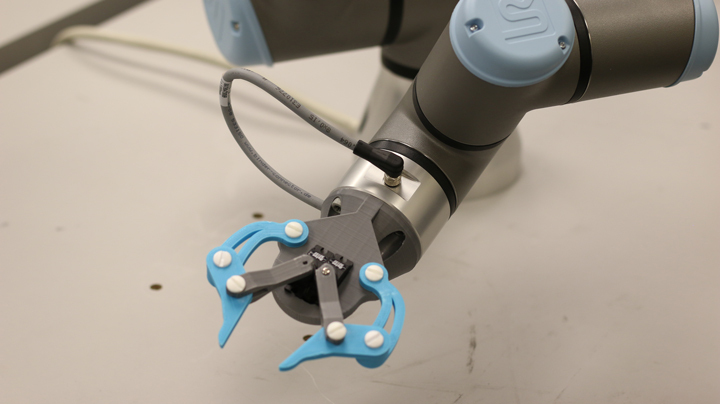 Using Universal Robots’ free online resources, Canyon Gamble, a high school student at RAMTEC, designed a 3D printed gripper for the UR3 robot. Experiences like Canyon’s gives the students ownership and has led to a large level of engagement both inside and outside the classroom. The free simulator and other online resources on the UR website are important components in the curriculum that the students can download and use without a required user license. “The simulator is a very powerful tool in the classroom because everybody learns differently and some of the students want to go through and practice it at home many times. So even if we don’t have enough robots, we always have enough simulators,” says Hammock, adding that the simulator is also used as an assessment tool. “In this way a lot of the programming actually happens outside the classroom, when we come into the classroom we can then focus on some of the more special things like integrating with Allen Bradley PLC,” says the robotics instructor who also teaches his students to stream commands to the UR cobots from the PLC through Ethernet IP, assigning tasks that involve using the free tech support and online resources on the UR website. Working with the UR robots has inspired Canyon Gamble to pursue a career in factory automation. “I think it would be cool if I could make a factory line and have one robot do one task and pass it onto the next. I just worked on having two Universal Robots interact with each other, so I could see how they would incorporate that with a factory line,” he explains. RAMTEC (Robotics & Advanced Manufacturing Technology Education Collaborative) is Ohio’s state-of-the-art facility designed to train and certify students on robots, CNC machines, hydraulics, programmable logic controllers, robotic and traditional welding and industrial maintenance equipment so that unfilled jobs across the state that require a highly skilled workforce can be fulfilled. The center opened in 2012 as an innovative collaboration between Tri-Rivers Career Center, Marion Technical College and The Ohio State University at Marion. There are now 24 RAMTEC sites throughout Ohio. Universal Robots is the result of many years of intensive research at Denmark's successful robot cluster, which is located in Odense, Denmark. The company was co-founded in 2005 by the company’s CTO, Esben Østergaard, who wanted to make robot technology accessible to all by developing small, user-friendly, reasonably priced, flexible industrial robots that are safe to work with and on their own can be used to streamline processes in the industry. The product portfolio includes the collaborative UR3, UR5 and UR10 robotic arms named after their payload in kilos. Since the first UR robot launched in December 2008, the company has experienced considerable growth with the user-friendly robots now sold in more than 50 countries worldwide. At just 195 days, the average payback period for UR robots is the fastest in the industry. The company, a part of Boston-based Teradyne Inc., is headquartered in Odense and has subsidiaries and regional offices in the U.S., Spain, Germany, Singapore, Czech Republic, India, and China. Universal Robots has more than 300 employees worldwide.